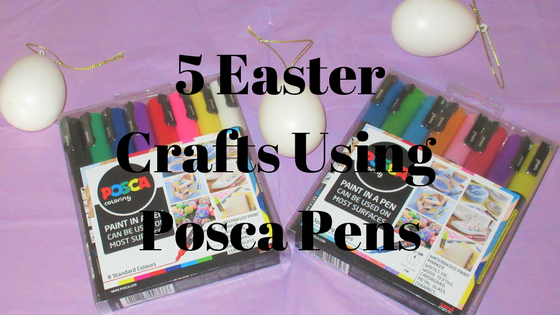 We’ve tried 5 Easter crafts using Posca pens over the last few days. 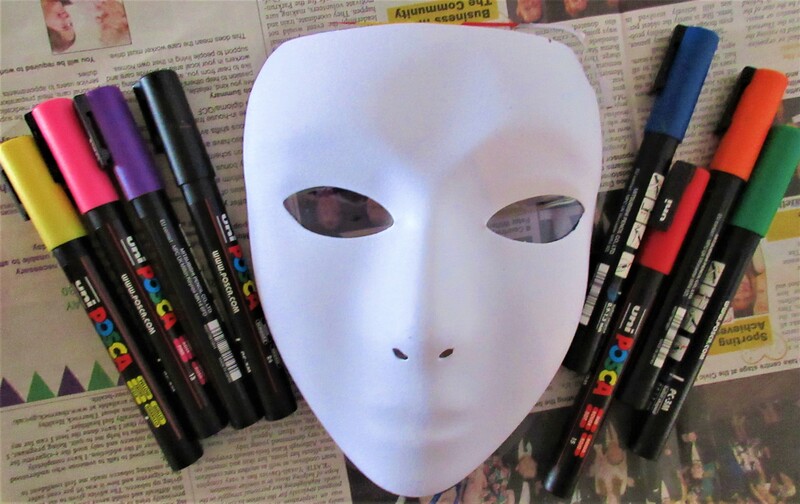 Posca pens are paint pens designed to be used on many different surfaces. 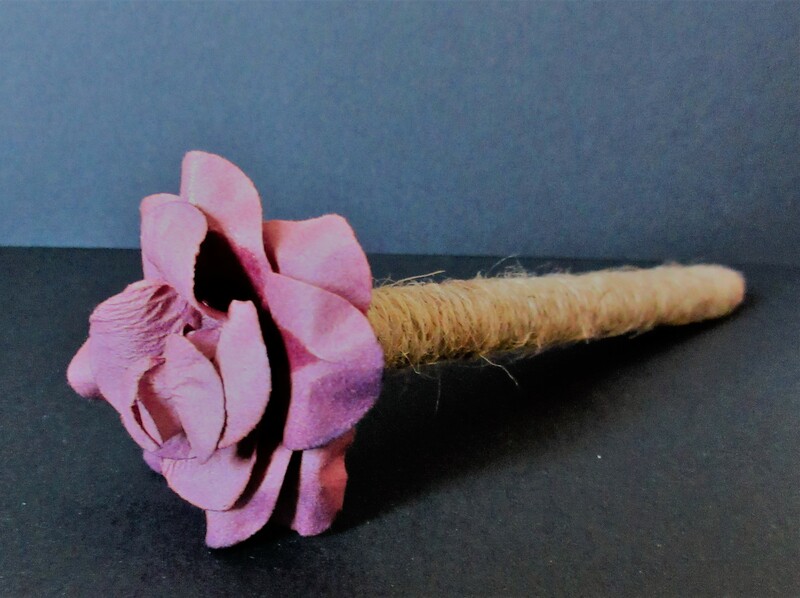 They are perfect for so many crafts! 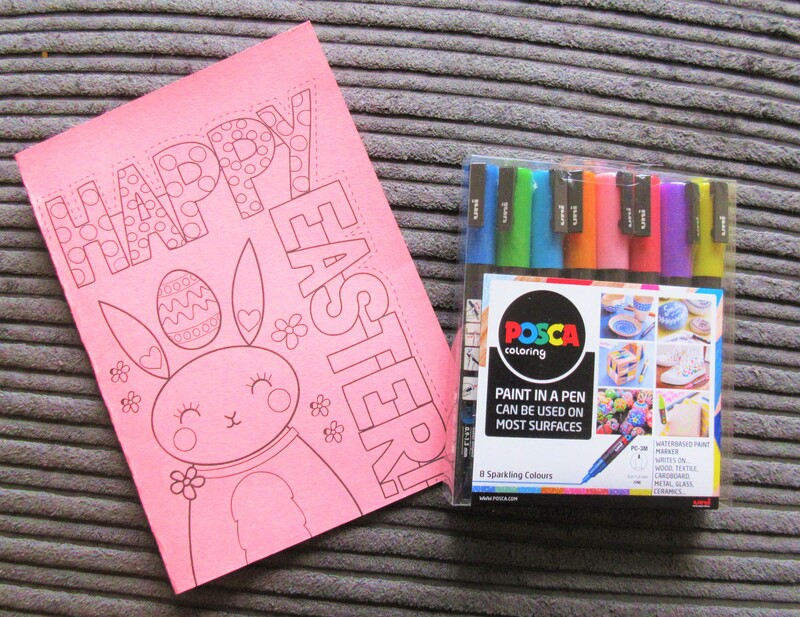 We received 2 packs of Posca Pens to help with our Easter crafts. We received an 8 pack of standard and an 8 pack of sparkling Posca Pens. Posca Pens are a Uniball product with a large range of colours & tip sizes for different projects. Posca Pens are water-based and non-toxic, unlike alcohol-based pens the colour doesn’t bleed through paper/card/fabrics. 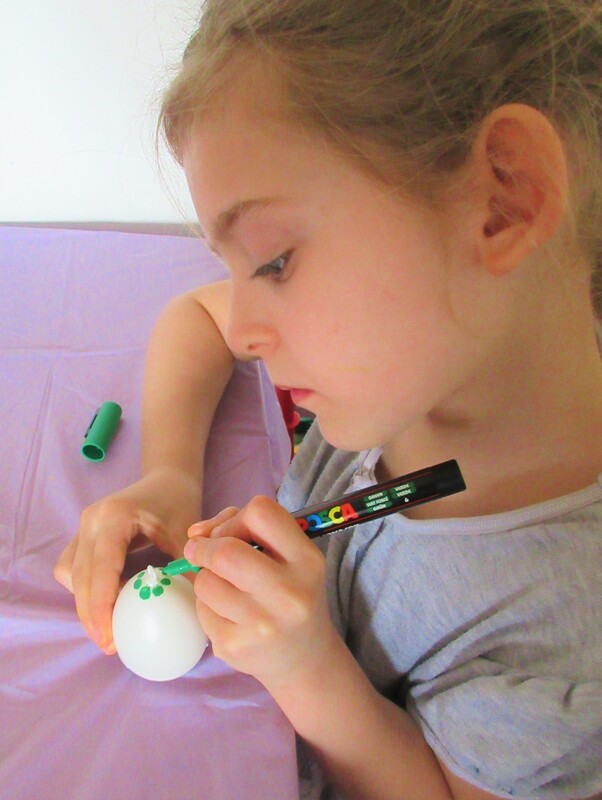 Our first Easter craft was decorating hanging egg decorations using Posca pens. Eva is a big fan of Posca pens having discovered them at a MetalArts event and loved them. She quickly pretended she couldn’t paint properly with paint and a brush after spotting new Posca pens. She decorated an egg using some of the new standard colours and a few left over from my last pack and came up with this design. Using the pack of standard colour Posca pens to decorate an egg myself, I was impressed with how well they covered the plastic. 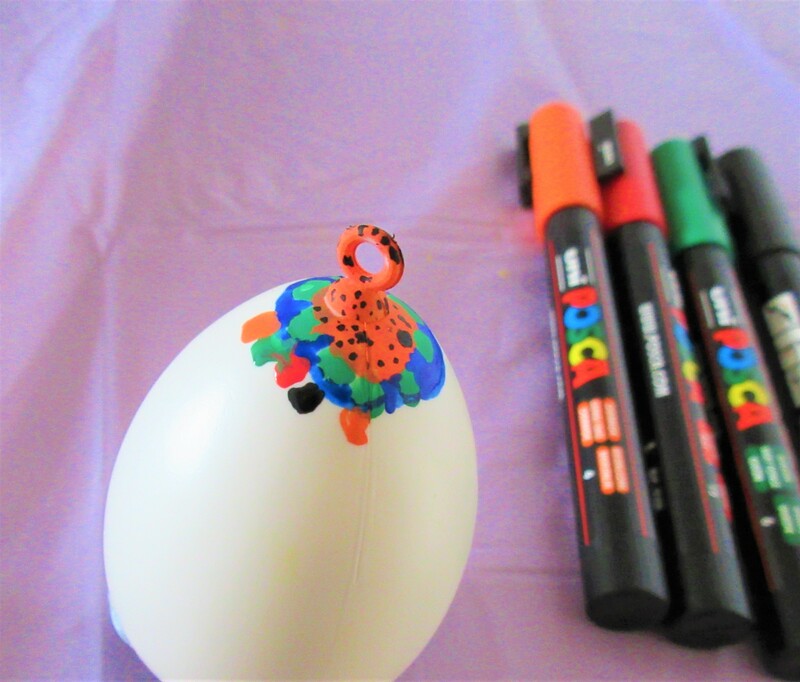 As you can see both eggs turned out really colourful and the Posca pens work brilliantly on these plastic decorations. Next, we decorated egg cups using the standard Posca pens. Cheating slightly as the flowers were part of the egg cup design, we got to work. We started off colouring those & adding more details & colours as we went. 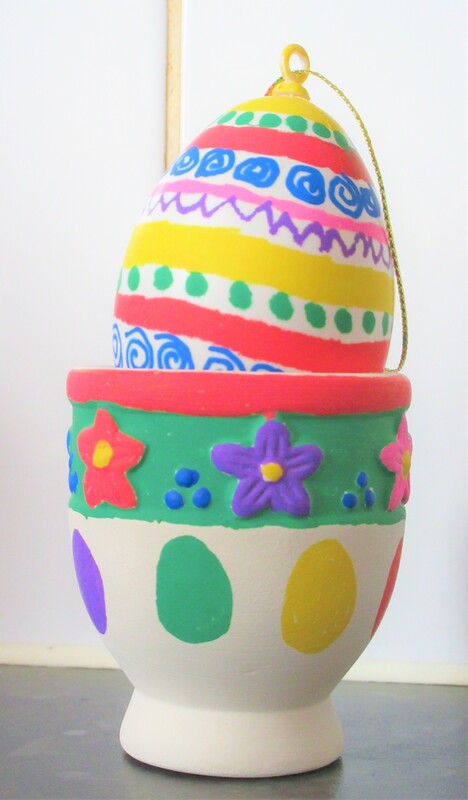 We then added some colourful Easter eggs all the way around the bottom. 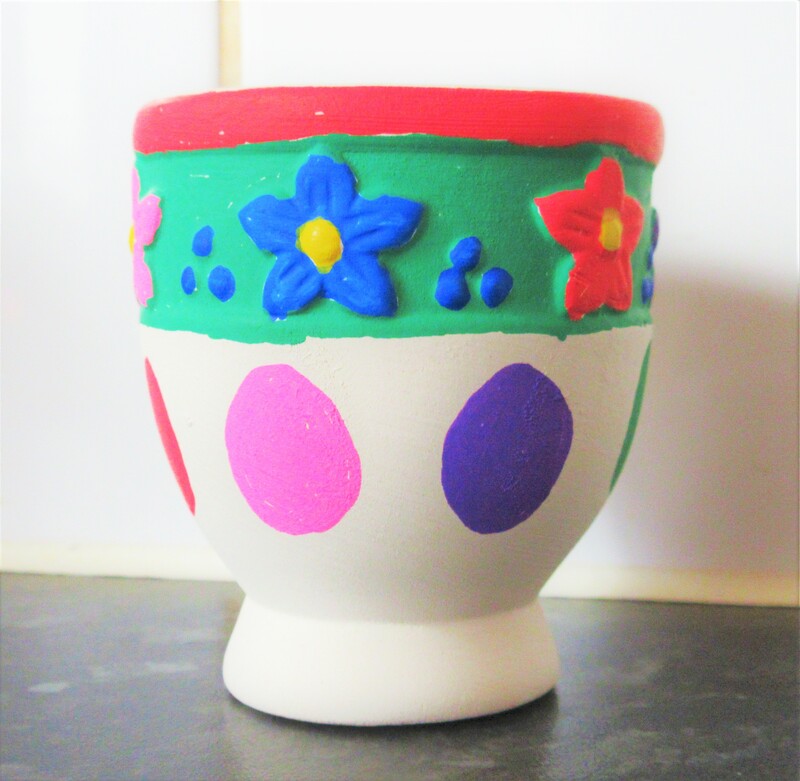 I was impressed with how easy it was to use the Posca pens to decorate the egg cup. Posca pens are fantastic for such a range of surfaces! Of course, it wouldn’t be easter without a lovely card so we visited Mrs Mactivity’s site, we love her printable resources designed by Polly Love. 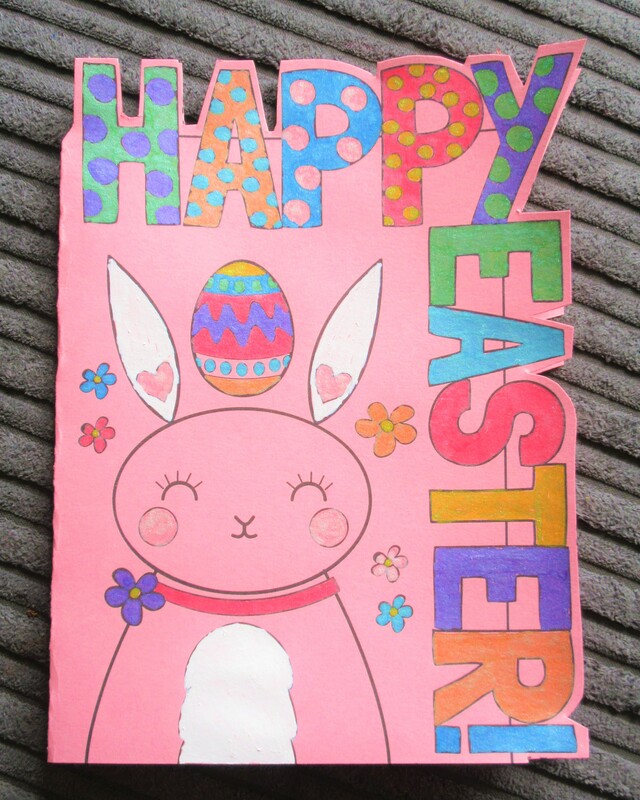 We found this lovely Silhouette Easter card which the girls think is really cute! We printed the card out on to pink card and used the Sparkling Posca pens to brighten it up. I also used the white Posca pen from the standard pack for the bunnies fluffy ears & chest. Posca Pens are great, even for simple things like numbering bunny footprints for an Easter egg hunt! They are so bright & vibrant, you can’t miss them! 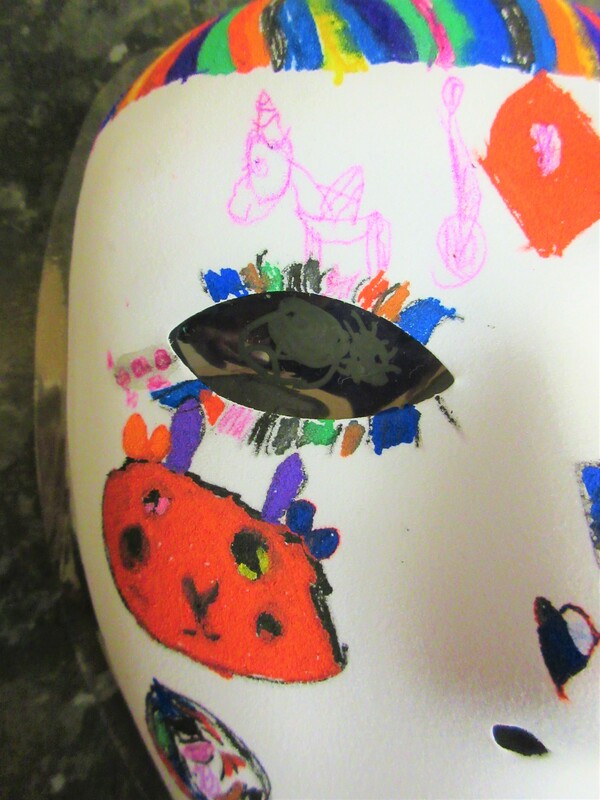 Masks are something the girls really enjoy decorating for all kinds of occasions. These had a felt texture on the top & the Posca pens worked really well. 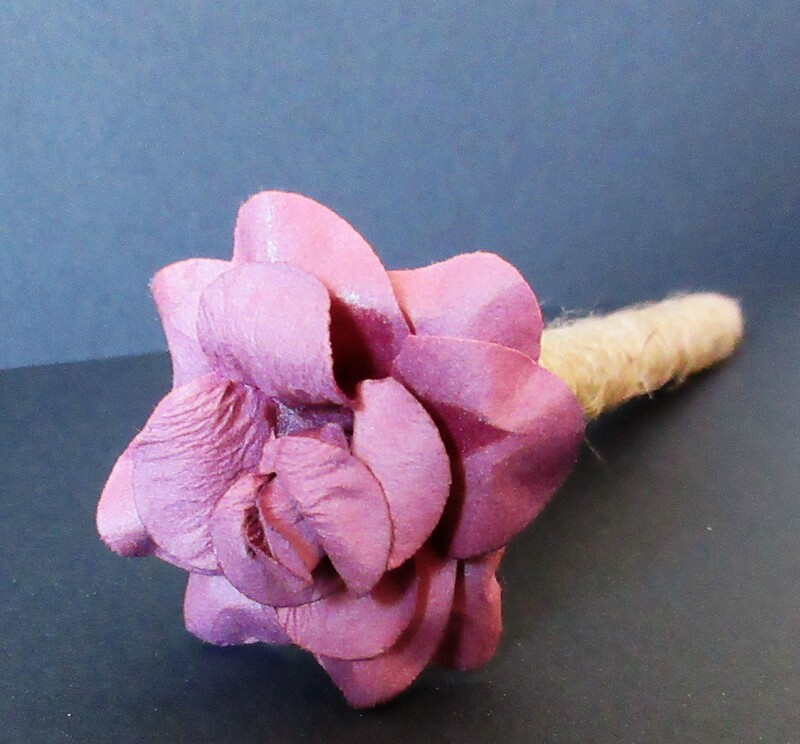 I had expected the colour to seep across a little but we didn’t have this issue which was a relief! Eva decided to make her’s a rainbow & bunny mask. Admittedly that bunny does remind of the Hell Bunny Logo haha! Eva is really happy with her mask and loves being able to use all the colours without them running into each other. You kind of expect paint pens to leak and run everywhere but Posca pens are amazing & once you get the flow going, so easy to use. They are so brighht & vibrant and we are totally in love with the Sparkling Posca Pens, you will no doubt see them featured on the blog again soon! 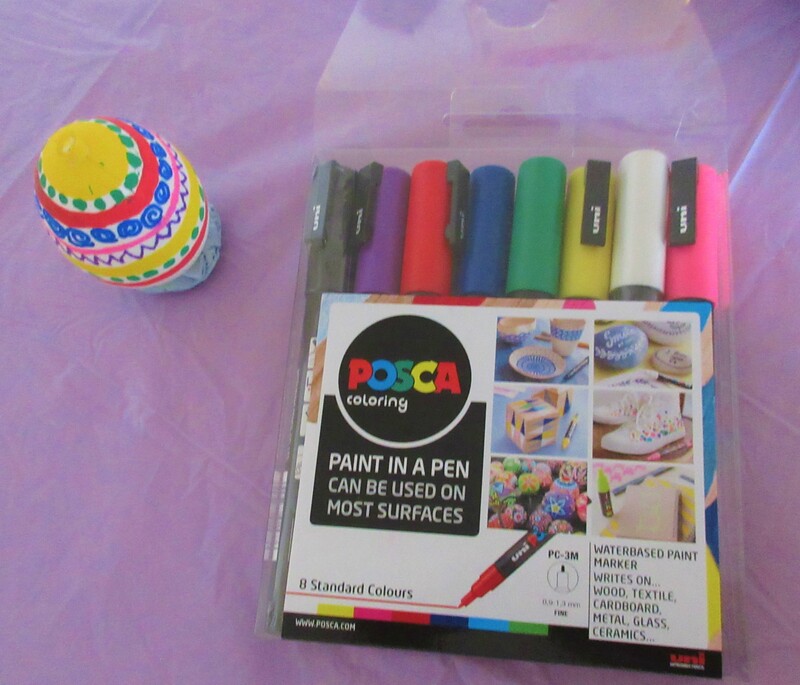 Have you used Posca Pens for Easter crafts before? I received a beautiful Diary from Ryman Stationary to help me stay organised throughout 2018. I love diaries and notebooks and stationary of all kinds so I was over the moon to receive a new diary. Ryman Stationary have a lovely range of diaries for 2018 including the one I received. This Rose Gold Butterfly Page A Day A5 2018 Diary is gorgeous and just £10.99. Designed exclusively for Ryman this beautiful diary would make a perfect Christmas gift, especially for a blogger. This is such a beautiful diary with shimmering rose gold butterflies on a beautiful floral background and a handy ribbon to mark the page you need. As a blogger it is always handy to have a diary nearby and the rose gold butterfly diary looks lovely sat on my desk. 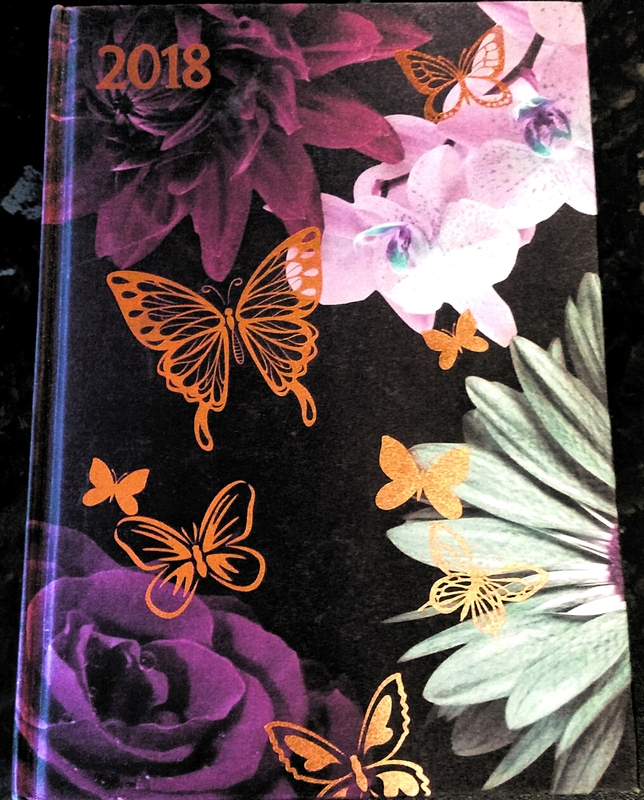 Some of you may have noticed from my Twitter header I love butterflies and with a purple rose too I am a little bit in love with this diary. I won’t lie I am secret wishing January to hurry up now just so I can start using it! This beautiful diary from Ryman Stationary will be going everywhere with me in 2018. 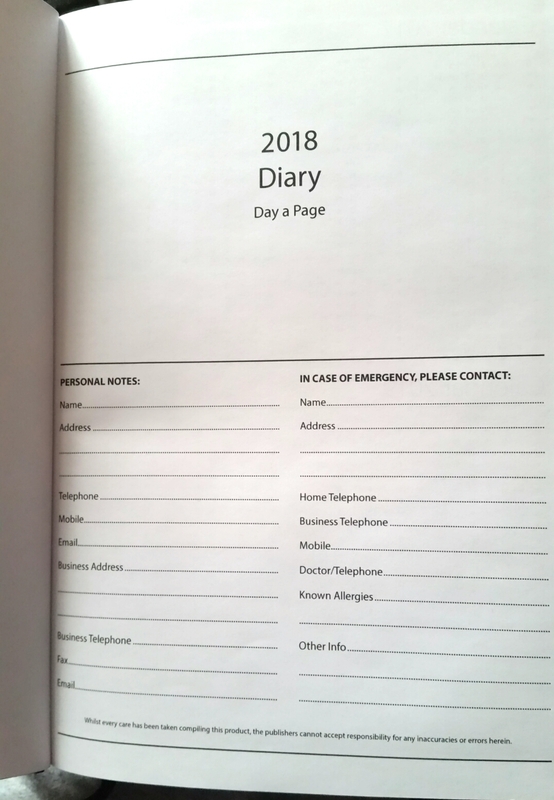 A page a day diary is great for me as I need the space to note down literally everything. Having things like reference pages, telephone numbers, important dates and times all in one place will be so helpful. Hopefully it will mean I am a little more organised in 2018! What do you think of this rose gold butterfly diary? Do you prefer page a day diaries too?